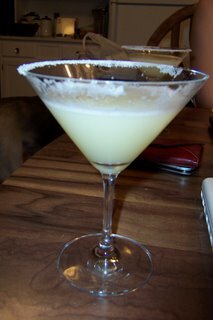 I've discovered lemon drop martinis this week at our friends Rob & Julie's house. Yes sir, I'll have another. As much as I want to, I can't handle any type of alcohol. I had WAY too many of those at BlogHer '06. They are to die for, and so addictive (and dangerous!) Happy Love Thursday! I am going to have to google the directions for this! Happy Love Thursday. Mmmmm, I'd love to try one of those!! My mouth is watering. Mmm.